Building a relationship with your audience should be the focus of your lead generation strategy. Before you can nurture that relationship, you first have to “introduce” yourself and entice new readers to your site. The main way to do this is through content marketing. All marketing strategies are based on the goal to gain maximum exposure for a brand. That exposure can manifest itself through the form of highly trafficked homepages/landing pages, newsworthy content that increases the change of virality, brand mentions from high-level publishers, and/or dofollow links boosting SEO value. If your brand’s content doesn’t show you have something to offer customers, then you’ve lost them. The key to creating content that’s a part of a solid lead generation process is grabbing the attention of new prospects and holding that attention with high-quality content that is interesting and evokes emotion. It is key to draw readers in with a headline that reveals your interesting topic and impress them with new information, actionable takeaways, or surprising results. For example, our campaign about the worst performing headlines on BuzzFeed was brimming with advice on crafting headlines that work. 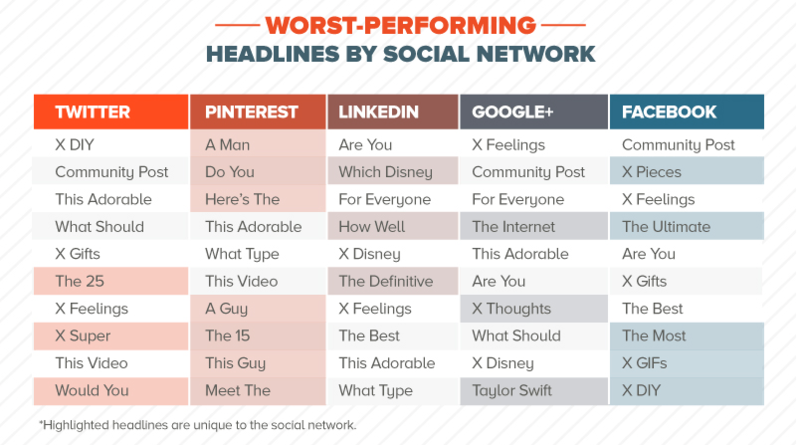 Our images capitalized on what was interesting (the worst headlines), and our copy provided tips on what type of headlines perform well. Through hundreds of successful content marketing campaigns, we’ve learned a thing or two about what catches the eye of audiences – and what propels prospects to click, keep reading, and share. In general, your lead generation content should be of such a high caliber that it gets press coverage. Relevant brand-oriented content paired with niche PR targeting helps to establish yourself as an expert in your particular field or vertical. The goal is to be seen on publications and blogs that write about your industry, thus maximizing your exposure to anyone searching and reading for there terms. Once you’ve reeled in new readers, don’t pat yourself on the back just yet. You need to provide prospective clients with proof that you’re an expert, can be trusted, and will deliver results. Don’t worry; we’ve got you covered there too. We rounded up the best types of content that pack the house with potential prospects, and the formats that convert them to customers. If lead generation is a top priority in your marketing plan, keep reading. When planning content for the top and middle of your sales funnel, you should choose topics your prospects want to know more about so they will find you when they’re seeking for information on that topic. HOW TO DO IT: Think along the lines of long-form or “deep-dive” content that provide in-depth answers for the questions they are searching for. Other types of content that inform and educate include blog posts, e-books, SlideShares, and comprehensive guides. Let’s look at some examples. 1) Every piece of new content is another opportunity for people to find you via organic search. 2) A schedule holds you accountable for creating new content consistently. As a content marketing company focused on growth tactics, content is what we do best and is often why people turn to us. Our post How to Repurpose Your Most Successful Content attracted quality leads for us because it provided a solution readers were searching for. The topic also performed well because it was essentially about saving time, improving efficiency, and utilizing existing resources. Nearly every person and company have these goals in mind, meaning there was a higher probability it would bring in organic traffic. Another one of our lead-generating blog posts is How Long Does it Take to See Content Marketing Results. The post offers timeframes and links to our case studies as examples. E-books are a great way to explain a topic to an interested audience. That’s the key, though – before you put in all the work needed to create a high-quality e-book, you must make sure the topic is worthy of comprehensive coverage for your intended readers. Our Tell-All Guide to Digital PR is a great example. It provides a complete overview of how to establish and maintain relationships with writers and editors at top media outlets. Remember how earlier we said our research campaigns are featured on major publications’ sites before posting on ours? This e-book breaks down how our media relations department does it for our clients as well as ourselves. Are you worried that giving away your process will expose your trade secrets? Don’t be. HOW TO DO IT: As long as you’re not putting proprietary information out there, explaining how you or your company works will show how much effort and expertise is involved in your craft. The e-book mentioned above is a great example of how we divulged the entirety of our promotions process. Many experts on our team provided valuable insights, including Cristina Bond, senior media relations manager at Fractl. Packing your e-books with valuable information like this that your audience can use raises your prospects’ opinions of you and your company. As a LinkedIn site, SlideShare allows you to upload presentations and easily share them with your network. We started using SlideShare as a way to host our presentations created for other reasons (e.g., conferences), but after seeing the success others were having with using the platform to expose themselves to new audiences, we expanded our use of it. 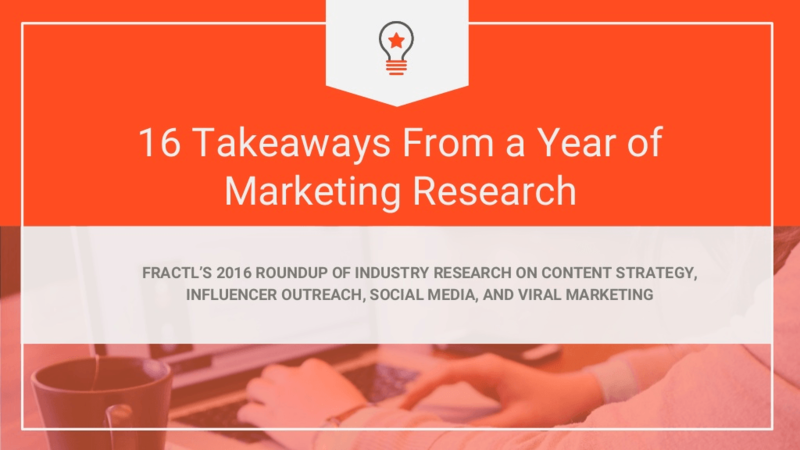 We’ve already received leads from our 16 Takeaways From a Year of Marketing Research SlideShare, which tallied nearly 1,200 views (at the time of publication). Viewers can “clip” and share individual slides, which is an excellent way to measure engagement with your presentation. As an example, below is a slide from one of Rand Fishkin’s SlideShares. SlideShares are an excellent type of content for lead generation because they allow you to package your information in a reader-friendly, aesthetically pleasing format. HOW TO DO IT: Simply choose your topic, compile your information and graphics, and upload your Google Slides or PowerPoint presentation to the platform. New prospects will find your information when searching the topic or coming across it when it’s shared on a social network. 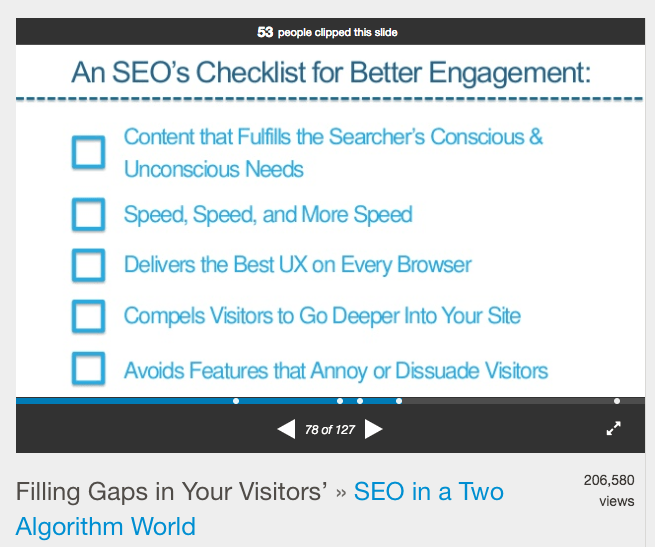 Not sure what to make the focus of your first SlideShare? Go back to a piece of content that performed well (say, a blog post), pull out the most interesting excerpts, and pop it into a slide presentation. Repurposing certain types of content into SlideShares is an efficient way to create valuable content (see – this post is always relevant!). As a bonus, SlideShares allow you to use branding to your advantage. We include our logo on all of the slides, link to Fractl resources on our site, and include brand colors and aesthetics. All of this helps people connect the content back to the company. A great form of evergreen content, guides attract new readers by expanding on a topic they’re interested in and, most likely, search for specifically. When planning to create a guide, it’s imperative you do your topic research and that it is indeed a topic that has high interest and hasn’t been exhausted. If you find multiple pieces of comprehensive content on the subject matter, and you don’t believe you can make yours more valuable, then don’t waste your time creating a guide on it. Numerous publications – including Entrepreneur and Adweek – featured the guide’s findings on their sites, which linked back to our site where new prospects could download the full guide. As a way to build our audience, we require prospects to provide their email address to download our gated content, like the etiquette guide. This can be the first step in nurturing a prospect into a lead. Once we have someone’s email address, we can continue sending them content similar to what they’ve already shown interest in. By doing this, we not only give them something of value but we continue to show we’re experts on the topic they want to know about, which builds their trust in our company. In many cases, a prospect who signs up for our email list may not need our services yet. But when the time comes that they do, they already know our company well and trust us. Let’s take a closer look at the type of content that converts prospects into leads. This is content that differentiates your brand from your competitors and proves you’re an expert. HOW TO DO IT: It should show examples of the results you’ve delivered (e.g., case studies and testimonials). You can provide value to your prospects and show off your expertise in content like webinars, white papers, and podcasts – content that has higher perceived value and explores the topics you cover in your “attraction” content more in depth. Approximately 25 percent of our leads convert directly from content we publish on our site. Of course, because various media outlets cover so much of our original research, it’s likely that a greater percentage first discovered our marketing studies in their press coverage and came to our site for more information. Case studies are a huge testament to your company’s success, and they show prospects that you can deliver results for them just as you have for other clients. They’re third-party proof that you can be trusted. HOW TO DO IT: Make your case studies as diverse as possible so that more potential customers can relate to the work you’ve done for clients similar to them. Our content marketing case studies are wide-ranging – from a B2B case study of Alexa to our three-year engagement with Recovery Brands to an examination of the success of single campaigns. They vary, but each reflects something particular about the way we do our work and why those strategies are valuable to our clients. HOW TO DO IT: Include results at the beginning of a case study, so readers understand up front what they’re going to learn by reading the content. Marketing white papers take a more academic approach than other types of on-site content. They’re geared toward professionals who are seeking the type of services you offer, and you need to speak to them as such in your white paper. Most of the time, people who are interested in white papers are very invested in the topic and are willing to provide their basic information (i.e., name, email address, job title) in exchange for access to it. This also means your white paper needs to be superb and leave your audience with actionable takeaways. If it’s not, your prospects will be disappointed they didn’t get value after providing their email and will certainly not want to retain your services. HOW TO DO IT: A white paper can go in many directions and can include several components. Be sure to keep in mind why your audience is reading it, and let that guide your content. Now that we’ve covered static types of content that convert leads, we’ll lastly explore live or audio content. These are your chance to shine as an expert! Whether you’re being interviewed or interviewing someone, hosting a podcast, or participating in a Q&A or AMA (Ask Me Anything) on a third-party site, do your homework first. Impress your audience by speaking authoritatively while still being conversational. HOW TO DO IT: If you’re interviewing a fellow professional in your field, do your research on him or her as well as the topic, plan your questions ahead of time, and get feedback from colleagues on what you plan to discuss. Even though you’re the interviewer, you’re going to have a dialogue and need to be fully informed on the topic. On the flip side, never pass up an opportunity to be interviewed; it allows you to show off your expertise as well as tout your service offerings. Fractl’s Associate Marketing Director Kerry Jones was featured on Dan Shure’s Experts on the Wire podcast. Highlighting a campaign that was covered on over 300 publishers’ sites, she discussed the process for getting massive distribution, the elements of a killer content marketing idea, and how to pitch your content to publishers. Kerry also found great success with her AMA on Growth Hackers, which targeted an audience keenly interested in content marketing. During an AMA (or another type of Q&A format), audience members have the opportunity to ask an expert questions on a specific subject matter. Since you won’t always have the questions ahead of time, it’s imperative you prep for it extensively – and have reinforcement (i.e., co-workers) on hand should you need some additional support. Interactive content like interviews, podcasts, and AMAs are some of the best ways to plug your company and demonstrate how you get results while providing true value to other professionals in your industry. Listening to or reading ones you aren’t participating in can be advantageous as well. They keep you looped into industry trends and new best practices, so sign up for notifications when new ones are published. No matter what type of content you decide to create, give it a proper home. Whether that’s on your blog or separate landing pages, readers need to find your content and navigate your site easily. Use appropriate SEO tactics in your content, so that new audiences can find your brand when searching something related. If you have an array of white papers, guides, or other gated content that converts leads, why not bundle them together? This tells prospects you absolutely know what you’re doing. For example, we combined nearly a dozen resources into our Research-Backed Guide to Increase Your Content Marketing ROI. This drove a lot of leads our way because many companies were familiar with content marketing but unsure of whether it would work for them, especially if they were unaware of the types of results content marketing can produce in comparison with native advertising or other marketing strategies. Having all of the information in one place added even more value than each resource had separately. No matter the product or service you provide, you can use content to attract prospects and convert leads.